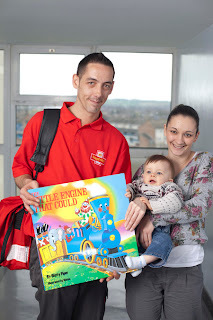 Postman Chris H., Finley & Marie E.
For several years now, programme champions of Dolly Parton's Imagination Library in the United Kingdom have been hard at work expanding Dolly's early childhood literacy programme. What started as just a few books in a few very small areas is now expanding quickly across the country. This fast growth catching on is not unknown. Not so many years ago, the United States starting seeing that same growth which continues even today! With passionate people making such wonderful progress, the programme has a very bright future ahead of it. Folks like Natalie Turnbull, the Regional Director for Dolly Parton's Imagination Library in the United Kingdom, work tirelessly to ensure success by being a major supporter of each and every programme champion as they build their own individual Dolly Parton Imagination Library programmes throughout the country and potential programme champions in areas not yet participating. A fine example of a United Kingdom Programme Champion is Cheryl Mitchell. We've seen Cheryl do everything from auction off items at fundraisers to dress in bear costumes just to strengthen and grow her programme which she so passionately believes in.